Back in 2009, Belinda Weaver had a decision to make. She loved marketing, but wasn’t especially happy in her job as a marketing coordinator. She and her husband were thinking about starting a family. Then she attended a one-day conference where she was hit by a figurative bolt of lightning after learning about copywriting. Welcome to the first post in our new series, The Hero’s Journey. We’re tapping the collective wisdom of our audience to learn from their business journeys. Belinda Weaver: I went to a one-day conference to hear a copywriter talk about writing headlines. The presenter wrapped up by talking about opportunities for freelance copywriters. I felt like I’d been hit by lightning! I didn’t even know that was a thing! Pursuing copywriting and taking charge of my career solved so many problems at once. With new fire in my belly, I signed up for a copywriting course and registered my business: Copywrite Matters. Within six months, my ‘secret side income’ almost matched my salary, and I knew it was time to take the next step. Rather than simply resign from my marketing coordinator job, I suggested a new working arrangement to the Managing Director. If he hired me as a freelance copywriter (at my new rate), I could handle the marketing campaigns, he wouldn’t need to hire anyone new, and he would save nearly $20,000 a year (based on projected costs). It took him less than 30 seconds to say “yes,” and I had my first retainer client! What do you offer, and what’s unique about your business? Belinda: I help aspiring copywriters become in-demand copywriters with copywriting courses, coaching, and stacks of free content. What makes my courses unique is the nurturing guidance I offer. I want every student to walk away with the skills they need to write effective and compelling copy. But more than that, I want them to have the confidence they need to be valued and paid well for their work. That nurturing guidance centers on my high level of availability and accessibility. My principle course, the Copywriting Master Class, has no time limits to submit work for review and ongoing access to me in the coaching forum. I want students to know that I have their backs even after they complete the course material. Would you share a challenge you encountered on your business journey? Belinda: I recently faced the challenge of friction. Friction between my business goals and ambitions, and my personal desires as a mother of a small (but growing) baby. It’s the old challenge of achieving work-life harmony. I tend to work during my daughter’s nap time. Just a few months into her life, I realized that I was scheduling eight hours of work when I had less than half that time available to work. When I wasn’t working, I was thinking about work; worrying and planning; sneaking off to the laptop to write a quick email or schedule a client call. Time with my young daughter was the very opposite of quality time! I was frustrated, tired, stressed, and overwhelmed. I felt like I was failing at everything. My work and client relationships felt the strain, and I wasn’t being a great mother either. I felt guilty. Belinda: My solution was to change the way I spent my time. Rather than working one-to-one on a linear succession of client copywriting jobs, I became a trainer and coach, working with many students at once. My ambitions and income aren’t compromised, and I can spend short bursts of available time a lot more profitably. I also boosted my ability to focus by learning meditation. Now, when I’m working, I’m more focused and get more done. And when I’m not working, I can give my full attention to the people and activities around me. I sometimes sneak off during playtime to jot down a quick note or idea, but overall, I’m a lot more present. I’m much calmer and happier. What’s working well in your business right now that you’d like to share? Belinda: I’m extremely proud of my Copywriting Master Class. I limit the class sizes so I can maintain the accessibility I mentioned. Students are responding very well to the content and the coaching forum is growing into a really supportive community. 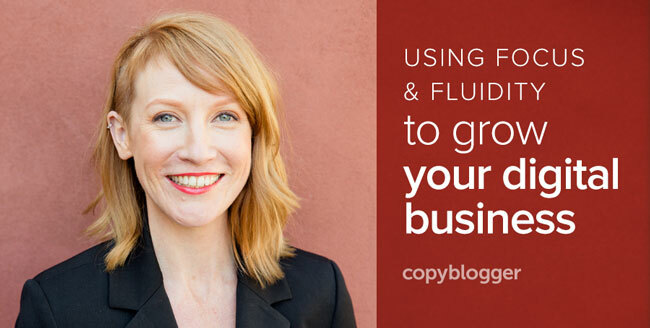 Which Copyblogger Media products do you use, and how do you use them? Belinda: My website is on the Rainmaker Platform, and I’m using as many features as possible. I launched my Copywriting Master Class on a regular page, but I’ll be moving it to use the new Learning Management System functionality. I’m also moving my shorter courses, like my SEO Writing course, onto the LMS. My students use the forums to share their questions, challenges, and success stories, as well as to get their course work reviewed. It’s a fantastic way to stay connected and it was created in a click! I’m setting up the automated marketing tools to help me check in with students who aren’t logging into the course. There are no time limits to complete the material, but I want to do everything I can to help students get the most out of their investments. The automated functionality will make it that much easier. I recently launched a copywriting podcast — Hot Copy — and will use the podcast functionality to promote it on my site. I also use the podcast features to privately publish coaching calls with students. I have a blog — The Copy Detective — so I use the editorial functionality and calendar, including all the awesome built-in SEO help. Finally, I’ve just launched an on-site affiliate program for my courses and had a few immediate sign-ups! And the Rainmaker Platform is solving problems I didn’t even know I was going to have! I’m a huge fan. Belinda: My number one goal is to keep offering amazing content. I’m excited by the content ladder I’m creating, using different platforms and media types to take customers from free to paid content. Right now, the end of that content journey is my Copywriting Master Class, but my goal is to create a subscription membership model. I’m creating a coaching program that will show copywriters how to create and run a successful business around their copywriting, and I’m looking to turn that into a membership program with regular subscribers. Goal number two is to maintain a sense of balance and harmony in my life. With all the new ideas I have, I have to be realistic about my availability to execute them. These clearly aren’t smart goals, ones all good marketers should create, but that reflects my life at the moment. Fluidity is essential. Visit copywritematters.com for information about her courses and lots of free content. Thanks to Belinda for appearing in our Hero’s Journey series.